Do you crave delightful and creamy pasta or delicious and savory pizza? You won’t go home hungry or disappointed when you dine at Benvenuto’s Italian Grill. At our Italian restaurant, Fond du Lac residents can enjoy a variety of appetizing and mouthwatering dishes for lunch or dinner. From fresh salads to tasty grilled steaks, our Italian restaurant in Fond du Lac offers something for everyone. Whether you’re celebrating a special event or simply hungry for classic Italian dishes, you’re always welcome to dine at our Italian restaurant in Fond du Lac. Our location has a large banquet space available for you and your guests. When you visit our Italian restaurant in Fond du Lac, you can have drinks at our bar or relax by our fireplace. Feel free to come over at any time. We can’t wait to serve you! Savor Classic Italian Cuisine at Our Italian Restaurant in Fond du Lac! No matter your cravings, you’re sure to find something to love at our Italian restaurant in Fond du Lac. We have a diverse selection of traditional Italian favorites for even the most discerning palates. Try our hand-stretched, wood-fired pizzas or our famous meatballs with homemade marinara sauce. 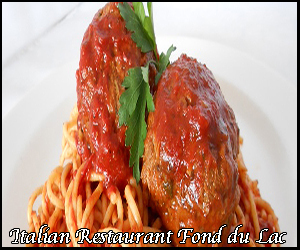 To ensure that you never run out of meals to try, our Italian restaurant in Fond du Lac rotates menus seasonally. Even if you’re a frequent diner, your taste buds will always have something new to explore at our Italian restaurant in Fond du Lac! Enjoy Dining With Your Loved Ones at Our Italian Restaurant in Fond du Lac! Are you looking to dine with your family at a place that is both comfortable and elegant? Benvenuto’s Italian Grill is perfect for you. At our Italian restaurant in Fond du Lac, we take pride in catering to families while still maintaining our sophisticated atmosphere. Our Italian restaurant in Fond du Lac offers menu options for adults and children alike. Celebrate Special Occasions at Our Italian Restaurant in Fond du Lac! When you want to host a special event, we have just the place for you. Our Italian restaurant in Fond du Lac has private dining areas and party rooms available for large groups. For groups of ten or more, we even have special menus. Whether you’re hosting a birthday party or a rehearsal dinner, our Italian restaurant in Fond du Lac can be your go-to venue! Order Healthy Menu Options That Accommodate Special Diets at Our Italian Restaurant in Fond du Lac! Do you have dietary restrictions? This won’t be a problem at our Italian restaurant. Fond du Lac individuals with special diets or allergy concerns can have a taste of our delicious dishes guilt-free and without reservations. Our Italian restaurant in Fond du Lac offers menu items that are gluten-free, low-gluten, meatless, low-carb, and more. Additionally, we want to make sure that the dishes our guests eat are healthy. This is why our Italian restaurant in Fond du Lac uses fresh and all-natural ingredients when cooking. Dine at Our Italian Restaurant in Fond du Lac! Come to Benvenuto’s Italian Grill, the favorite Italian restaurant of Fond du Lac families. With us, you can expect nothing less than the best food and service. Won’t you let our Italian restaurant in Fond du Lac be a part of your special celebrations? Be our guest today, and have a taste of the diverse flavors of Italy!